We love to spend a weekend at Terranea in the beautiful peninsula of Rancho Palos Verdes. It is a perfect retreat close to LA, and the five restaurants are all terrific, but Mar'Sel, the flagship is one of my favorite locavore restaurants anywhere. Chef Micheal Fiorelli hits it out of the ballpark with every dish, and as soon as the bread basket lands tableside, you know you are in for a treat. 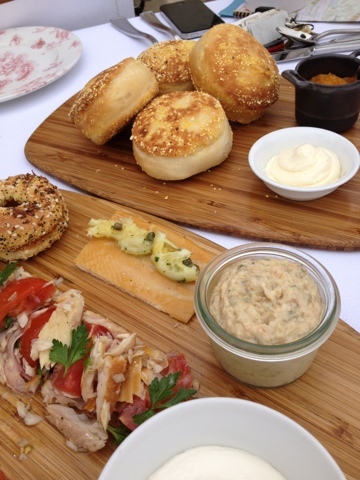 The restaurant is famous for the home made English Muffins, served at dinner as well as brunch. These really are first rate, and not that hard at all to make. So next time you have breakfast guests (yeah, I know, its summer!) bake these up. 1. Combine yeast and water in a standing electric mixer bowl. 2. Whisk with a dough hook to dissolve the yeast. 3. Gradually add the room temperature buttermilk. 4. Add the flour, sugar and salt, and then turn the mixer to medium speed. Mix until a wet dough forms. 5. Add the room temperature butter one tablespoon at a time. 6. Remove the dough from the mixer and knead for 10 minutes. 7. Place the dough in a lightly greased large mixing bowl. Cover with plastic wrap and leave to rest for one hour. 8. Chill the dough in the refrigerator for 30 minutes. 9. Dust a work bench with flour. Roll the dough out to about a half-inch thick and using a ring cutter, cut into desired sized circles. 10. Transfer muffins onto a sheet pan lined with cornmeal, leaving a little room between each. 11. Preheat oven to 250 degrees. 12. Heat a frying pan greased with clarified butter over medium Iow heat. Slow cook the muffins on each side until they are evenly golden brown. 13. Transfer muffins back to the sheet pan. Bake for approximately ten minutes. Allow muffins to cool, then poke a fork around the circumference of each muffin so they can be pulled apart easily. Another really simple dinner roll recipe comes from Alton Brown, and these can become Parker House Rolls, Butterflake rolls, or really great burger rolls.